Recent research in psychology has studied the effects of typography on human cognition. The research points toward multiple applications such as helping readers remember the content better and strategically use fonts to help dyslexic readers. Three fundamental aspects of typography are legibility, readability, and aesthetics. Although in a non-technical sense "legible" and "readable" are often used synonymously, typographically they are separate but related concepts. Legibility and readability tend to support aesthetic aspects of a product. Legibility research has been published since the late nineteenth century. Although there often are commonalities and agreement on many topics, others often create poignant areas of conflict and variation of opinion. For example, Alex Poole asserts that no one has provided a conclusive answer as to which typeface style, serif or sans serif, provides the most legibility,[unreliable source?] although differences of opinion exist regarding such debates. Other topics such as justified vs unjustified type, use of hyphens, and proper typefaces for people with reading difficulties such as dyslexia, have continued to be subjects of debate. Positive images (e.g., black on white) make handheld material easier to read than negative or reversed (e.g., white on black). Even this commonly accepted practice has some exceptions, however (for example, in some cases of disability,[unreliable source?] and designing the most effective signs for drivers). Typography utilized to make reading practical: Typography not only has a direct correlation with honoring the tone of the text, but also shares the responsibility of making the audience commence the reading process as well as sustaining the audience's attention throughout the body of text. Although typography can potentially be utilized to attract the reader's attention to commence the reading process, and create a beautiful/attractive piece of text, the craft of typography is not limited to aesthetics. Typography is a craft that is not stringently encompassed with the aesthetic appeal of the text. On the contrary, the object of typography is to make the reading experience practical and useful. The use of bold colors, multiple typefaces, and colorful backgrounds in a typographic design may be eye-catching; however, it may not be appropriate for all bodies of text and could potentially make text illegible. Overuse of design elements such as colors and typefaces can create an unsettling reading experience, preventing the author of the text from conveying their message to readers. ^ Berry, John D. (16 August 2004). "dot-font: Being a Typographer". CreativePro. Creative Publishing Network and CreativePro. Retrieved 7 April 2015. ^ a b Clair, Kate; Busic-Snyder, Cynthia (2012). 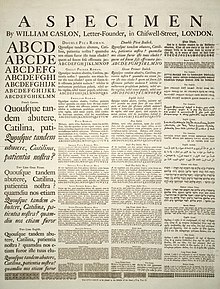 A Typographic Workbook: A Primer to History, Techniques, and Artistry. John Wiley & Sons. pp. 4, 123. ISBN 978-1-118-39988-0. ^ Tsien, Tsuen-Hsuin (1985). Paper and Printing. 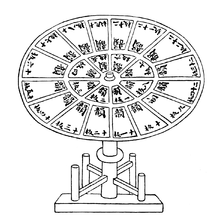 Needham, Joseph Science and Civilization in China:. vol. 5 part 1. Cambridge University Press. pp. 201–217. ISBN 978-0-521-08690-5. ^ Ch'on 1993, p. 19. ^ "Printing", Encyclopædia Britannica, 2006 . ^ Dowding, Geoffrey. An Introduction to the History of Printing Types. London: Oak Knoll Press, 1998. p. 3. ^ a b Rothenberg, Randall (23 July 1990). "Computers Change the Face of Type". New York Times. ^ Carter, Rob; Day, Ben; Meggs, Philip B. (2012). Typographic Design: Form and Communication. p. 125. It is the earliest mechanization of a handicraft: the handlettering of books. Typographic design has been closely bound to the evolution of technology, for the capabilities and limitations of typesetting systems have posed constraints upon the design process. ^ a b c "Typography". Credo Reference/The Crystal Reference Encyclopedia. Credo Reference. Retrieved 2 November 2014. ^ a b c "Type". Credo Reference/The Columbia Encyclopedia. Credo Reference. Retrieved 2 November 2014. ^ "The Evolution of Typography" (PDF). Infoamerica. Retrieved 2 November 2014. ^ a b Haley, Allan (2012). Typography, Referenced. Beverly, MA: Rockport Publishers. ISBN 978-1-59253-702-0. ^ "On Legibility – In Typography And Type Design | Learn – Scannerlicker!". learn.scannerlicker.net. Retrieved 5 November 2015. ^ "Expressive Web Typography: Useful Examples and Techniques – Smashing Magazine". Smashing Magazine. 13 September 2010. Retrieved 5 November 2015. ^ "Font Psychology: New research & practical insights". Cognition Today. 28 May 2018. Retrieved 2 January 2019. ^ "Typography: Often invisible, always essential | Insights | Larsen". Larsen. Retrieved 4 February 2016. ^ "What Is Typography? | The Importance of Typography in Web Design". Bop Design. 8 July 2013. Retrieved 4 February 2016. ^ Stanley, Thomas Blaine. The Technique of Advertising Production. New York: Prentice-Hall, 1940. p. 40. ^ Stanley, Thomas Blaine. The Technique of Advertising Production. New York: Prentice-Hall, 1940. ^ Glaser, C. Knight, J. When Typography Speaks Louder Than Words. 13 April 2012. ^ "Typography". History of Graphic Design. Retrieved 24 October 2017. ^ "Typogrphy: Inscriptional and architectural lettering". My self and my world. Retrieved 24 October 2017. Bringhurst, Robert (2004), The Elements of Typographic Style (3 ed. ), Point Roberts, WA: Hartley & Marks, ISBN 978-0-88179-133-4 . Jury, David (2004), About Face: Reviving the Rules of Typography, CH: Rotovision, ISBN 978-2-88046-798-2 , 159 pp. Papazian, Hrant H (2000), "Improving the Tool", in Swanson, Gunnar (ed. ), Graphic Design and Reading: explorations of an uneasy relationship, New York: Allworth Press, ISBN 978-1-58115-063-6 . Swanson, Gunnar (2000), Graphic Design and Reading: explorations of an uneasy relationship, New York: Allworth Press, ISBN 978-1-58115-063-6 . Warde, Beatrice (2000), "The Crystal Goblet, or Printing Should Be Invisible", in Swanson, Gunnar (ed. ), Graphic Design and Reading: explorations of an uneasy relationship, New York: Allworth Press, ISBN 978-1-58115-063-6 . White, Alex W (1999), Type in Use – Effective typography for electronic publishing (2.0 ed. ), New York: WW Norton & Co, ISBN 978-0-393-73034-0 . Lexique des règles typographiques en usage à l'Imprimerie nationale [Lexic of the typographic rules used at the National press] (in French), Imprimerie nationale, 2002, ISBN 978-2-7433-0482-9 . "Typography" . Encyclopædia Britannica (11th ed.). 1911. pp. 509–548.